Hideki was an ordinary guy who failed his college entrance exams. Hideki however is no quitter, so he decided to move off of the small farm and move into the big city to attend a cram school to hopefully pass the exams next year. It wasn't more than a few minutes before Hideki noticed how so many people in the city had persicons. A persicon is a sort of android which can do many functions traditionally done by personal computers and servants. Persicons come in all shapes and sizes, but most of them look like people, except for their "ears". Hideki knew he wanted a persicon, but considering the tens of thousands of dollars needed for one, he'd probably never be able to afford one. But as fate would have it, on his way home one night he comes across a persicon left in a trash heap. Hideki decides to take her home and keep her - it would be a shame to leave the cutest persicon he'd ever seen in the garbage after all... 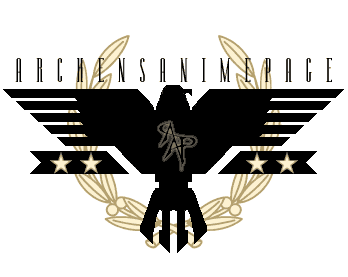 But as it turns out, the persicon is far from normal. At first all she can say is "chii", which he decides to name her. Then there is the fact that she doesn't really know... anything, so he has to teach her. It didn't take long until Hideki found out that Chii isn't just a normal persicon. She acts like a normal girl more than a persicon at times. 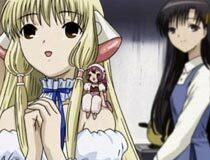 Her mysterious past continues to show hints that she may in fact be one of the "Chobits" series of persicons: a persicon that thinks for itself. For Hideki this became a dilemma more and more as he became drawn to Chii. A persicon can't think and feel things the way a human can, which is why people shouldn't (although often still do) get attached to them. But what if a persicon could think and feel like a human? And what if Chii were one of those persicons? I couldn't tell you why I decided to watch this series. I managed to see a trailer for it which definitely turned me off, yet one night I randomly decided that I wanted to watch it. At first there were a lot of similarities to the dreaded "Hand Maid May". It seemed like the series was destined to fail rather quickly. At first I thought: OK, so shes an android girl who can just say "chi", this is going to get old fast. And just when it almost did, she starts talking. So the teaching thing looked like it would get old fast as well but by that point your already in the middle of everything - which manages to pick up from there on. In a nutshell, that means the series starts very slow, and plot advancements happen in small increments. So the bottom line is that if you find a cute robot girl in the trash: keep her. I mean who wouldn't want a cute robot girl? Oh look, she just says "Chii"! That's soo CUTE!!! Err, no WAIT! That's not the bottom line at all! No the bottom line is that while cute looking on the surface, there really is a bit more substance under that shell. Eventually the base of the series evolves into questioning the relationships between humans and machines (or more specifically persicons). Now that SOUNDS like a simple "Hideki and Chii get together because that's the way it is" sort of plot, but you find many many instances reminding you that persicons are just machines in the end. In fact I'd say it did such a good job that even I wasn't sure if Hideki and Chii should be together at all. And that in itself is a strength of the title - to make you think about it. It's also sort of an added bit of irony that Hideki helps his friends through problems caused indirectly by persicons, but himself ends up attached to one. 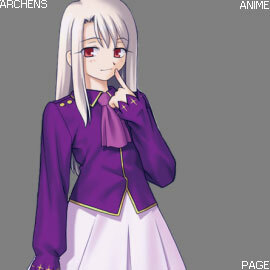 As an added note, the Japanese voice actress who plays Chi had the *perfect* voice for the part, and shows her exceptional versatility and talent. 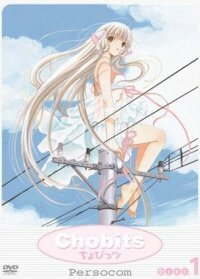 So in summary Chobits is a rather slow moving cutesy sort of anime with a decent plot that takes time to develop. If you need something fast moving with a hard edge, then this isn't for you. If you're easily annoyed by the over-abundance of happy cutesy music (and there is WAY too much of it believe me) then beware. 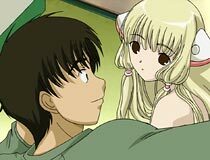 Otherwise if you're looking for a lighter sort of romance title, then Chobits would definitely be a title to consider. Shimizu: It's too late. I saw everything... It's average sized. Chii: Average size. Hideki is average. Hideki: Chii! You don't have to memorize stuff like that!